Mike Dwight March 30, 2015 Category: Uncategorized. It’s Spring and Time To “Ready” Our Boats! Home | Uncategorized | It’s Spring and Time To “Ready” Our Boats! Forespar Product News: Swim Step Davit System For Inflatable Dinghies – NO STORAGE – NO TOWING. 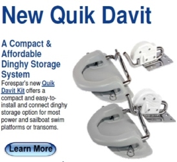 Forespar’s new QUIK Davit Kit offers a compact and easy-to-install or connect inflatable (soft or hard bottom) dinghy storage options for most power and sailboat swim platforms or transoms…securely and tightly against the swim step. Mike Dwight March 29, 2015 Category: Uncategorized. English Painter J.M.W. 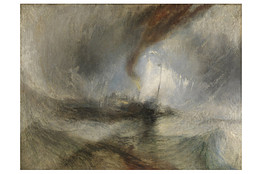 Turner’s (1775-1851) painting “Set Free” is currently on display at the Getty Museum. Depicting a raging sea and a ship caught in a deep trough between two surging hills of waves that surround the endangered boat, this famous scene reminds us that the ocean has drawn us in for centuries; some of our sea journeys are more remarkable than others. Mike Dwight March 27, 2015 Category: Uncategorized.